Why are costs increasing year after year in spite of technical innovation and information sharing? As health insurance costs increase 6-17% annually across carriers, can your organization continue to afford an appropriate level of benefits for your employees? ChallengeWave is a private community for your employees and employee dependents to start and stick with healthier lifestyles. ChallengeWave works through influencing motivational factors across a wide variety of personality types. ChallengeWave is a bottom up approach allowing employees to choose who motivates them and who they can motivate. By creating a private social network founded on social support, collaboration, and competition, ChallengeWave keeps people focused on their health longer and reduces the time spent "off-the-wagon". 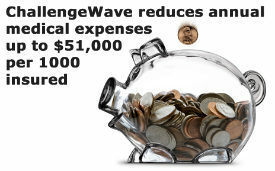 The goal of implementing ChallengeWave is to reap the benefits of a healthy workforce ».